Had a thought about the time piece on this page it seems to set a time for possible navigation purposes using the stars to pinpoint a lat and long. Piano keyboard layout is not correct. O man, it's on 11 too. North America - top of key taps N.A. Wondering why there is no tail on the goat. Thanks. Didn't notice that till now. At first glance, the drawing looked like an antelope rather than a goat (lanky legs). Capricorn is located in an area of sky called the Sea or Water which is where Pisces and Aquarius lies. Originally, the goat had a tail of a fish and was referred to as a sea-goat. Maybe the tail was removed to keep the trover from "attaching a tail" to complete the image in his or her mind thus ignoring it's anomaly. The focus may be THE SEA... to SEE. Just my thoughts on the matter. This may be yet another indicator in homage to MASQUERADE, vis a vis Newton's fabled encounter with gravity. Has anybody noticed that the Vit Man is wearing some sort of necklace? I don't think it's a necklace, but rather the neck muscles connecting to the clavicle. What are Vitruvian Man and the Santa Maria doing on this page? They really stick out as foreign elements not connected to anything else in the book. 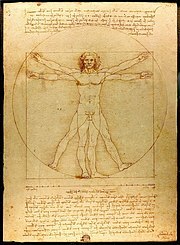 Vitruvian man was drawn in 1492, same year as Columbus sailed the Santa Maria to the west. The pocket watch hands are pointing at 1 and 4, not sure how to get the 92. The Vitruvian Man drawing and text are sometimes called the "Canon of Proportions", which may tie into "A Measure of Gold" and the geezer picture with his canon. The Santa Maria is also (point of interest)ing by itself. I saw a great documentary today on History channel about the Kensington Runestone. Among other things, the connected the Templars with Columbus. That got me thinking again about this page. Da Vinci was a weird reference, except for the date of 1492. A really interesting part of this documentary explained how the Swedish monks (assisted by the Templars) would double-date their runes in language and in code to protect their carvings. Now, stay with me here. The Da Vinci reference brings me also to the novel where keystones figure prominently. This hunt is all about finding keys. Stone bridges, of the kind common along the carriage roads of Mt. Desert Island, have keystones. The Da Vinci Code book was at its height of popularity (and indeed it was very popular) at the time Fandango was written. Perhaps 1492 is a double-date clue pointing to the keystones?